The mission of the Office of the Provost and Vice President for Academic Affairs is to provide Texas A&M University-Commerce leadership and guidance to the academic colleges and divisions in the areas of research, instruction, scholarly activity, and globalization. 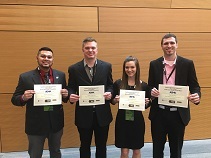 Undergraduate students from Texas A&M University-Commerce’s Department of Health & Human Performance and College of Education and Human Services placed second at the 2018 Applied Sport Management Association (ASMA) conference case study competition. They were the only undergraduate team competing against Division I opponents at the conference held at Baylor University in Waco on February 15-17. Click here to read full story. On January 4, 2018, Dr. Betty Block, professor of Kinesiology in the Department of Health and Human Performance at Texas A&M University-Commerce, was named the 25th Fellow of the National Association for Kinesiology in Higher Education. A National Association for Kinesiology in Higher Education (NAKHE) Fellow is one of the acknowledged leaders in the field of kinesiology who has the added distinction of providing ten or more years of outstanding service to the organization. “Her leadership, service and scholarly contributions have extended beyond the field of kinesiology to her home institution, community, and beyond,” said Ron Feingold, Chair, Fellows Committee, NAKHE. “These contributions bring distinction to her university and the profession of kinesiology.” Click here to read full story. KANSAS CITY, Kan. - Garrett Blubaugh, a redshirt sophomore at Texas A&M University-Commerce, is the recipient of the Elite 90 award for the 2017 NCAA Division II Football Championship. Blubaugh, majoring in biological sciences, currently carries a 3.96 GPA. Blubaugh was presented with the award during the banquet on Thursday evening at Children's Mercy Park. Blubaugh was previously named All-Academic by the Lone Star Conference. He is also the second-leading tackler with 80 tackles entering Saturday's National Championship Game. Blubaugh is the first student-athlete from A&M-Commerce to win this prestigious award. Click here to read full story. 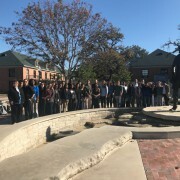 Forty-one students from A&M-Commerce recently attended the Texas A&M University System’s 14th Annual Pathways Symposium, hosted by Tarleton State University, and thirteen of those received research awards. First place winners include Moyosore Odebiyi, graduate student in Business & Computer Information Systems; Mengzhe Chen, graduate student in Mathematics; and Shiraz Khan, graduate student in Physical Science. Second place winners include Noor Faisal, an undergraduate Agriculture major; Sona Grigoryan, a graduate student in Business & Computer Information Systems; Vidhi Goti, a graduate student in Education; and Nobel Chowdhury, a graduate student in Life Science. Third place winners include Ajogu Idoko-Akoh, a graduate student in Business & Computer Information Systems; Gaurav Dhurandhar, a graduate student in Education; Raney Cortez, an undergraduate Education major; Tsitsi Msabaeka, a graduate student in Mathematics; Sam Kaiser, an undergraduate Physical Science major; and Jodi Nicholson, a PhD student in the Humanities and Social Science department. Click here to read full story. 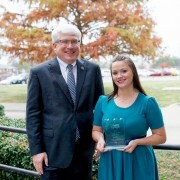 Tiffany Kral received the “Clinical Teacher of the Year Award” from the Texas Directors of Field Experience (TDFE) for her student teaching at Commerce Independent School District. She was one of three teachers to accept the award at the Consortium of State Organizations for Texas Teacher Education (CSOTTE) on October 22 in Corpus Christi. Kral credited part of her success to the faculty’s ability to communicate with her as a colleague as opposed to a student-in-training. Click here to read full story. NEW ORLEANS – The Texas A&M University-Commerce track & field programs had 10 scholar-athletes named as All-Academic on Friday by the U.S. Track & Field and Cross Country Coaches Association (USTFCCCA). NCAA Division II men's decathlon National Champion Florian Obst was named the Male Outdoor Field Scholar Athlete of the Year. Additionally, the women's track & field program earned All-Academic Team honors. Click here to read the full story. Four graduate students from Texas A&M University-Commerce have won awards at this year’s Federation of North Texas Area Universities’ Graduate Student Research Symposium, all in their respective categories: Education, Humanities, Social Sciences and Business; and Science, Technology, Engineering and Math. Click here to read full story. 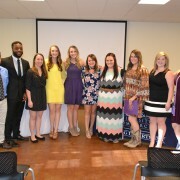 Ten students from the Bachelor of Science in Nursing program at Texas A&M University-Commerce were inducted into the Iota Nu Chapter at Large of Sigma Theta Tau International Honor Society of Nursing. STTI membership is by invitation to baccalaureate and graduate nursing students who demonstrate excellence in scholarship and to nurse leaders exhibiting exceptional achievements in nursing. Click here to read full story. COMMERCE –The Texas A&M University-Commerce athletics department announced today its academic honors from the 2016 fall semester, with 183 student-athletes earning honors for their work in the classroom.As a whole, the student-athlete population boasts a cumulative grade point average of 3.166, taking into account all 14 sport programs. Eight of the Lions' 14 sport programs had a team grade point average over 3.0 for the fall 2016 semester. Click here to read full story. LOUISVILLE, Ky. – 13 members of the Texas A&M University-Commerce softball team were honored for excellence in the classroom as they were named 2015-16 Easton/National Fastpitch Coaches Association (NFCA) Division II Scholar-Athletes. The honor was given to student-athletes with a grade point average at or above 3.5. A&M-Commerce was one of only 14 Division II schools with at least 13 honorees. There were a total of 963 student-athlete honorees from Division II programs. Click here to read full story. 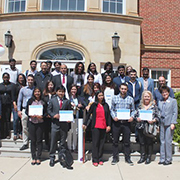 At the recent Texas A&M University System 13th Annual Pathways Research Symposium hosted by Prairie View A&M University, Texas A&M University-Commerce took home 18 awards: 15 in specific disciplines and three for placement overall. Participants included students from all 11 universities within the system with nearly 900 students, faculty and staff in attendance. Click here to read full story. AUSTIN, Texas - The Texas Higher Education Coordinating Board on Wednesday (10/26/16) awarded the 2016 Star Award to the Texas Affordable Baccalaureate program at Texas A&M University-Commerce. Click here to read full story. CLEVELAND, Ohio – A total of 41 student-athletes representing Texas A&M University-Commerce have been awarded the Division 2 Athletics Directors Association's Academic Achievement Award for their efforts in the 2015-16 academic year, as announced Thursday. Click here to read full story.